The day before the trip begins. I have never started my journal the day before in the past. I am sure I wouldn't be today except that we are visiting my mother in the nursing home and I am quite bored. My mother has Alzheimer's so visiting consists of me watching TV while my mother and father sit next to each other and fall asleep. Oh well, hopefully it will be a good time. I am sitting at the airport. My dad has already left on his flight. I was going to try to change my flight this morning if I could con them out of charging me the $75. I planned everything so nicely. I had a mid day flight so that I would not have to get up early and drive through rush hour traffic. 8 days ago all those plans fell through. Then this morning things did not go well. We left home a few minutes late. There was a traffic jam on the expressway. It took us 1/2 hour to get through the check in line. We were running so far behind I didn't want to take the time to change my flight. There was another 15-minute wait to get through security. I had forgotten how slow 85 year olds walk. Even though we got to the airport 1 1/2 hours early (I had planned on being here 2 hours early) we got to his gate only 20 minutes before his flight was scheduled to leave. So here I sit 3 hours and 40 minutes to go. Finally!!!! I am on my way to Ottawa. We met the rest of the group this evening. There are only 4 of us plus the guide. It seems like a real good group. There were lots of funny stories. I use to spend the winters in Phoenix for my job. When I did that all my bad luck traveling seemed to happen on my way to or from Phoenix. I always drove so I wouldn't have to put my dogs in the cargo hold of the plane. I got poison ivy so bad one time that I had to stop at an emergency clinic and get a shot. One time the water pump seized. Another time the clutch went out. Once I got a bad case of the flu the night I arrived in Phoenix. I even got snowed in in New Mexico one April. Now that I don't go to Phoenix all my bad luck happens on my vacations. T he flight out of Ottawa had to divert to Kuujjuaq because there was a fire in Iqaluit. The high school brunt down and the fireman who're usually on call for the airport were fighting the fire at the high school, so the airport was closed for two hours. When we finally made it to Iqaluit we were delayed another hour waiting for a flight attendant. A half hour out of Iqaluit we had to turn back for a medical emergency. An old gentleman on the plane had an asthma attack and stopped breathing. They gave him oxygen and got him breathing again and by the time we got back he refused to get off the plane. They had to call the Mounties and have him physically removed. However we finally made it to Igloolik before dark. Of course it won't actually get dark here until September. Today we drove from Igloolik out to camp. Camp consists of a few buildings built out of 2x4's and 3/8 inch ply wood, which makes the floor a bit bouncy. To sleep there are pads on the floor and some cots all outfitted with sleeping bags. The cabins also have kerosene heaters and you can get hot water from the kitchen. 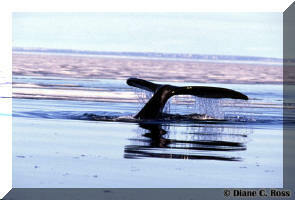 After getting settled in we plan to go out to the flow edge to see the bowhead whales. However, before we can leave the ice shelf in front of camp lets go and starts to float away so we have to wait for them to rescue their boats, which were floating away with the ice shelf. Silly me. I think that because I am comfortable in a T-shirt on shore that that is all I need to wear under the survival suit we are provided with. WRONG. The wind chill on the boat is brutal. I am cold when ever the boat is at speed and the flow edge is about 1 hour from camp. When we get there we see lots of whales. We seem to be surround by them. For lunch we stop on an ice flow. To get fresh water you just have to find a shallow pool of water on the ice that is not close to the edge and does not have a hole in the bottom of it. After a couple hours we head back. When we get to camp the tide is low and we can't get the boat to shore because it is too shallow. Eventually we get off on a point of ice that is still attached to the land and walk in. I thought I would be warm today. I put on my thermal underwear and a long sleeved shirt and I still froze. We went out to see the walrus, which is about twice as far a the bow head whales. We were also out for about 10 hours. I was fine as long as the boat was not moving but man was I cold when it was. We saw lots of walrus. I would say twenty to thirty. (The guide says 69 but he was counting walrus you had to use binoculars to count. I only counted the ones we got close to.) One of the groups we saw had about a two month old baby with them. Was he ever cute. 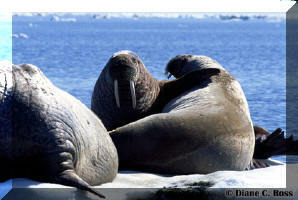 He would clamber right up on top of the other walrus. We ate lunch out on the pack ice. It is a lot more stable than I thought it would be. I have read lots of books were people get stranded on the ice and I have always thought that small pieces of ice would be very unstable but they are not. The guide got out on some pieces that weren't more than 4 ft across without a problem. Of course the water was as smooth as glass. Waves would change things a lot. We got back at low tide again. This time we had to wait until the tide came in enough to drag to boat to shore. And I do mean drag. The guide got out and pulled the boat, scrapping bottom all the way. This morning we went for a short walk to see some of the wild flowers and birds. At the first wildflowers I was trying to take pictures of I was attacked by three puppies. I think the others wanted the puppies to go away because they kept jumping on you when you were trying to photograph something and they kept running ahead and scarring the birds. As far as I'm concerned they were the highlight of the walk. Who cares about wildflowers and birds when you can have three puppies jumping on you, licking you, and chewing you with their sharp puppy teeth. The wildflowers will always be there. The puppies won't. We went back to the flow edge today. We didn't see as many whales but we got a lot closer to at least one whale. A whale appeared to be coming our way but then went down and stayed down for a few minutes. I assumed that he had just swum away under the water. I was scanning the horizon looking for other whales when one came up right at the back of the boat. I was standing on the opposite side of the boat near the front and I could not see any water between the boat and the whale. I wish I had thought to take a picture but my first thought was that I had better find something to hang onto in case the whale hit the boat. When it was over the whale had only caused the boat to rock no more violently than the wake of a small boat would. But I should start at the beginning rather than the end. 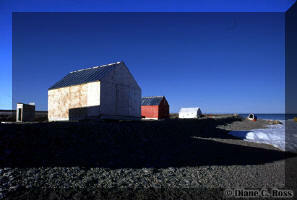 We started by hiking back to some old sod buildings that the Inuit probably used to store meat in. The buildings are caved in and there are lots of wild flowers and old bones to photograph. While I enjoyed shooting at the ruins this isn't really my cup of tea. It is just something to do to fill in the time. After lunch we headed out to the walrus again. 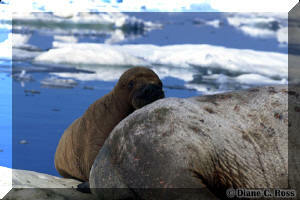 We found three groups of walrus shortly after arriving at the pack ice. Then we take a break on an ice flow. During our break the fog rolled in. I have always loved the fog. For me it changes the world into a mysterious place. The pack ice floating in the fog is like something out of a movie. On the way back we find a mother and her pup on an ice flow. We cut the engine and drift in on them. Mom is a little nervous and snorts at us. She makes another noise and the baby runs to the edge of the ice but does not go in. He inches around behind her but he is too curious to stay out of sight. He keeps poking his head up over her rump. He is so adorable peeking at us. We drift closer. Mom turns around. Now I have full frame shots of mom's head above the pups’ head. I shot about 2 1/2 rolls of film in less than 15 minutes. It was fabulous. After dinner I went down and worked the tidal flats. 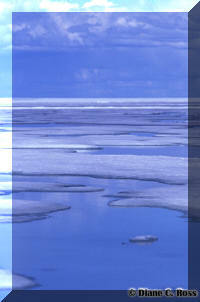 The tidal flats in the arctic are not the same as in warmer climates. There are no starfish, or sea urchins, or colorful fish. Instead the ocean leaves a fantasyland of ice. Fantastic sculptures glistening in the sun. Some pieces are larger on top than on the bottom and look like they should fall over but somehow manage to defy gravity. I have no idea how. Today was our last full day at the camp. I think it was the warmest day we have had here although it got windy and cold in the evening. It was also a disappointing day. We went out to the flow edge again to look for whales. While we did see a couple at a distance none of them got close enough to photograph. Tomorrow morning we head back to Igloolik. We will spend a day and a half there and then fly to Iqaluit for another day. This is my least favorite part of the trip, the cultural part of the tour. For some reason everyone thinks they need to add a couple days to a trip for you to see the sites in some city or other. If I was interested in seeing the city I would have booked a trip there instead of some remote, out of the way, place where I could photograph animals. Oh well, I guess if I want to eliminate the city tours I will have to quit booking trips through travel companies. The plans for getting to town are another fiasco. They must change at least 5 times before we leave. Plan A was for the dad and I to be driven into town and dropped of at the camp owners house so that we can take showers. While we are cleaning up they will go back out to camp and pick up the other three. Once they get back they will take my father and I up to the hotel. Plan B is everyone will drive part way into town. About half way in we will stop and take some pictures of some Inuit village ruins. Then they will take my father and I into the camps owners house and leave the others to take more pictures of the ruins and go back and pick them up after drooping us off. Then we switch back to plan A. Then back to plan B again. When my father and I get into the city we are dropped off at the hotel instead of the camp owners house which I guess is plan C but no one ever told me about it. The itinerary said we would spend the day at camp and leave sometime in the afternoon, but we don't. We leave at 10:30 in the morning. To be honest I would like to go out to the walrus again but there isn't enough time for that today (even if we hadn't left until the afternoon). I don't really care to go see the whales again so going into town early isn't a huge deal except now I have to kill basically two days in town and there is very little to do here (I already told you I don't like the city tour parts of these trips) I assume the trip leader will eventually show up and tell us what happens next. What the plans are for dinner, how we get to the airport. Actually he has my ticket out of here so he had better show up sometime. My dad is OK, since he booked late, he has an E ticket. I am bored and would like to go for a walk around town but I don't want to leave until the trip leader shows up to tell us what is going on. I hate being stuck here with nothing to do! I said earlier that the whole trip was a bit disorganized. First the trip leader thought we were spending the first night in Igloolik at the camp owners house. 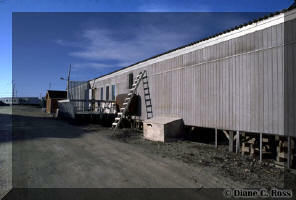 The itinerary said we would be staying at the Igloolik Inn but we actually stayed at the Turomivik Hotel. The trip leader didn't really have leadership skills. Every night we had to ask what the plans were for the next day. Once he even made a snide comment about hating that question. On trips like these, what you do depends in large part on the weather and the tide. If we were getting up and having breakfast at the same time each morning and then deciding what to do for the day it would have been OK. However one morning we had breakfast at 7, one morning at 9, another morning at 8, etc. Each night we would have to ask what time breakfast was going to be. After we asked the leader would have a discussion with the camp owner about the next days plans and then tell us what was happening. I don't think I should have to prod the trip leader to get this type of information. In addition one of the participants was allergic to fish but the company forgot to pass that information onto the camp owner. They also made my flight reservations in the wrong name. They made them for Ann Ross instead of Diane Ross. Well at 3:30 I got feed up and decided to walk down to the camp owners house. We walked by it the first night we were in Igloolik and I was pretty sure I could find it again. (We left camp about 10:30 and it is about a 1-hour drive to town. Which means we arrived here between 11:30 and 12:00. The truck had to go half way back to pick up the others, which would have taken another 1 to 1 and 1/2 hours. They should have arrived around 1:30 at the latest. That means we were left hanging for at least two hours with no idea what is suppose to happen. Two hours doesn't sound nearly as bad as it feels.) The others were just coming out as we arrived. I asked if we were supposed to eat dinner at the hotel. The trip leader asked if that was part of the package. I told him that hotel said dinner would be at 6 but I didn't know if it was part of the package or not. He said he was sure that the camp owner would be cooking something for the people who were staying with him. As far as I am concerned we are eating at the hotel. If they want us to eat at the camp owners house they will have to come and get us. My father is 85 and walking to the house and back wiped him out and I will not have him do it again! We all went up to the co-op and then to a grocery store in town (except my father who we dropped off at the hotel on the way by). They aren't set up for tourists here but then they probably don't get many. No T-shirts or other knick knacks with Igloolik on them. On the way back I asked what time we were going to the airport tomorrow and our intrepid leader said sometime tomorrow afternoon. As if I couldn't figure that much out for myself. So tomorrow I have time to kill in a very small town but I have no idea when I need to be back at the hotel to go to the airport. Give me a break! On the bright side, the hotel cooked us porterhouse steaks with pan fried potatoes for dinner. It was excellent. The food at camp was a bit on the tasteless side so the steak probably tasted better than it really was. However, I thought it was one of the best steaks I had ever had. To be honest if it hadn't been for today I wouldn't have mentioned the disorganization of the trip because it was just a minor irritant. Today was just the straw that broke the camels back and I hadn't even realized it was close to breaking. If this were my first trip this with this company today would probably stop me from ever booking another trip with them. However, I have traveled with them twice before and both of those trips were excellent in every respect. One or two of these things happening on a trip wouldn't faze me. There are always little problems traveling. However all of them happening on one trip makes me wonder what is happening at the company. A few years ago three companies merged into one company, according to the trip leader they are breaking apart again. I hope that the problems on this trip are just growing pains because of the split. * I feel I should add a note that while my dad and I were in complete agreement about the guide, the other two people on the trip had both traveled with him before and liked him. Although, one of them was his personal friend. The trip leader came up around 10:30 to fill us in on the days events. We will be going up to photograph an inukshuk in a little while. The hotel is getting a truck to take some other people to the airport so I made arrangements for us to go with them around 5 P.M. I found out that I had my tickets all the time. I am glad I didn't throw out what I thought were just my boarding passes back at camp. Today we had a tour of Iqaluit. I don't really like city tours, but as far as city tour goes it wasn't bad. However it did provide another example of poor leadership. Around lunch time we went back to the hotel to clean up before heading up to a local park for lunch. When we were about half way to the park the trip leader mentioned that there would be lots of wildflowers to photograph at the park. If he had mentioned this at the hotel I would have been able to bring a macro lenses. Since he didn't mention all I have is a wide angel lens that is worthless for wildflowers. Admittedly I could have carried all my camera gear around with me, just in case, but I didn't feel like hauling 25 pounds of equipment around on a city tour. We had dinner at the Frobisher Inn. The local artists come in one or two at a time while you are eating and sell their work to anyone who is interested. It is kind of a fun way to shop for souvenirs. I don't usually want to get home after one of these trips but I want to go home. I did not want to leave camp. I could have stayed there forever but this slow crawl home is getting old. We left camp 4 days ago! Nikki died today. Exactly two weeks after my return from Igloolik. I feel guilty because she spent almost 2 weeks of her last month on earth in a kennel. I also feel guilty for not taking her to the vet. She was throwing up on and off for a week. The problem was she would throw up one day and be fine for the next couple of days and then throw up again. Nikki would eat anything so her getting an upset stomach wasn't unusually. However, throwing up every few days for a week was. My father called me around 2 PM and told me she was dead. I wish I had taken her to the vet but I didn't think was really sick. Obviously I was wrong. 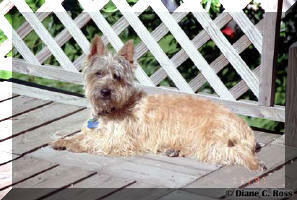 Of all the dogs I have owned Nikki was the one I loved the most. Probably because she had chosen me for her human. I was the one she always came to when she needed something, when she was scared, or hurt. She could also sense when I was depressed and would come to give me some kisses and a cuddle. Now she is gone at the age of 8 and the house is so terribly empty. I wish I had taken her on more walks and given her more car rides. She use to enjoy those so much. I want another dog that I connect to the way I connected with Nikki but I don't know how to find one. I love all dogs but not all dogs can touch my soul the way she did. I would give anything if I could only have her back.